Broadly speaking, USPS's operations entail the intake of mail through its retail, bulk mail acceptance, and collection box network; the processing of mail within its ever-diminishing network of plants; and the delivery of mail to 151 million addresses and P.O. Boxes around the country. The messenger of delivery is, of course, your friendly neighborhood mail carrier, who is stationed at your nearest postal 'delivery office'. Usually the carrier would originate from a/the post office in your ZIP code, but a USPS program called Delivery Unit Optimization (DUO) is moving thousands of carriers away from their traditional offices into a regional 'hub' offices alongside carriers who serve other neighborhoods or communities. When this happens, the offices that lose their carriers get 'demoted': the Postmasters who originally supervised carriers work with a reduced staff and get reduced pay. Additionally, USPS often looks to downsize its operations in the 'losing' communities in its oft-repeated sound bite: "right-sizing our network." What this actually means, however, at least if the 'losing' community possesses a historic post office building, is that USPS will now sell said building to a developer through its real estate agent (CBRE) for instant cash. In return, USPS will lease back a minimal, characterless retail space nearby and call all things equal. In some parts of the country, it would seem as though USPS is going out of its way to move carriers out of historic downtown post office buildings into neighboring communities or a town's outskirts whenever possible, rather than vice versa. (In fairness, most of these cheap-land outskirt facilities maintain a larger footprint.) California features many controversial examples of historic downtown buildings recently sold as carriers are dumped to outlying facilities: Berkeley, Ukiah, Venice, Santa Monica, and La Jolla, to name a few. In the northeast, Manhattan and southern Connecticut are feeling this trend rather acutely: at least several Manhattan post offices have or are slated to be relocated to smaller premises within a year (the Washington Bridge, Triborough  a.k.a. 'Tito Puente', Old Chelsea, and Peter Stuyvesant Station post offices). 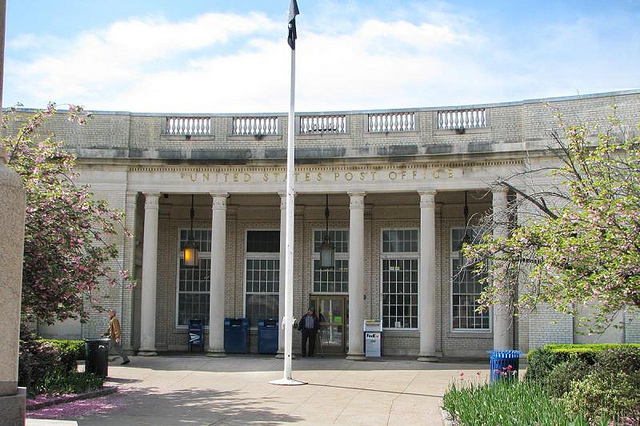 Connecticut has or will soon experience the repurposing of historic post office buildings in the cities of Greenwich, Stamford, Westport, Fairfield, Derby, Norwich, and New London. To further explain this postal logic: as of 2010 there were 21 carrier routes stationed in the New London post office, an amazing building which deserves its own entry on this blog. Plans are to move all of the carriers who serve New London out of the city and into an early-'90s facility in nearby Waterford, four miles away. That equates to 20 carriers traveling four additional miles twice a day, likely all requiring their own mail trucks (as opposed to many taking walking routes). It should be noted that each of the historic New London post office's three floors of space possesses more room than does all of Waterford's facility. What can you do? Fairfield County in southernwest Connecticut features several examples of how the Postal Service is abdicating its role as a steward of an unparalleled bounty of New Deal architecture by eviscerating its holdings to least-common-denominator shells. And if it can happen here, in some of the richest communities in America, then it can happen anywhere. The Postmaster General responded to concerns of the Berkeley community with spurious financial memes, such as the faux-accounting claim that USPS is losing $25 million per day, ergo such sales are necessary to preserve the future of the Postal Service (in which case four $6.25 million< historic building sales would help USPS stay on its feet nearly 24 hours longer! Clearly there's a fallacy in here somewhere). It also claims the facilities are no longer needed due to "continued mail volume declines" and "changing consumer needs". No, it's not that; it's that all the carriers are being crammed into neighboring communities so the old building can be sold to developers. The initiator of Delivery Unit Optimization is clearly getting a huge promotion. Constructed: 1916-7. Sold: 2011 for $15 million. New purpose: Restoration Hardware, a 'luxury home furnishings purveyor.' New Deal mural: "Old Days in Greenwich" by Victoria Hutson Huntley, 1939. The sale of this monumental 17,000-square-foot operation, most recently called the Greenwich Avenue Station post office, was made possible by USPS's moving mail processing and delivery operations out of this facility (a.k.a. implementing DUO) to the 1993 Greenwich Main Post Office on the outskirts of town. 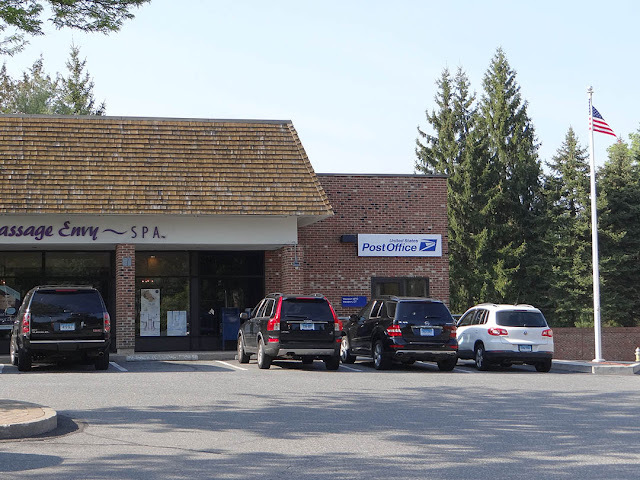 In its stead, the Postal Service has leased a previous pet supply store for $258,000 per year (see USPS's Leased Facilities Report: CT). The new facility, which is about 0.4 miles north of the old post office, is designated the Downtown Station post office. It features an Automated Postal Center and a lobby that is accessible 24/7. It's also got a new, odd style of retail counter layout that lets anybody walk between the customer area and the restricted employee area if one wanted to. Fortunately the building and the artwork will remain intact and in the community. The former site is presently surrounded by fences and is inaccessible to the public while renovations occur. The stonework façade is being restored and "4,500-square-foot second level with a sunken roof deck" is being added. The mural is being restored and moved across the street from the old post office to the Greenwich Board of Education headquarters. Constructed: 1935. Sold: 2011 for $2.35 million [Appraised at $3.6 million]. New purpose: Post 154, a boutique restaurant. New Deal artwork: none. 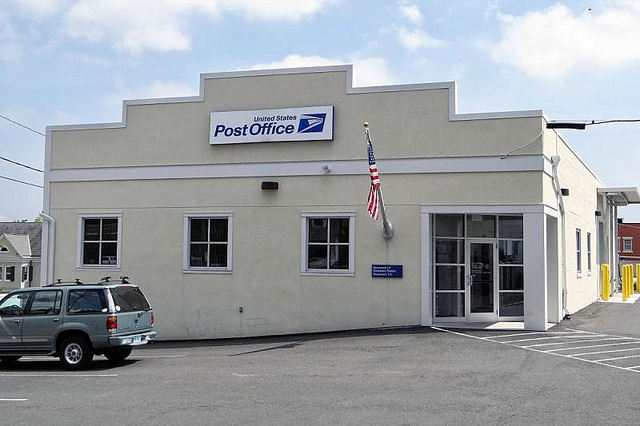 The sale of the stately Depression-era Westport post office was made possible by moving carrier operations into a carrier annex (constructed in 2000) in adjacent Norwalk. (More precisely, 2.5 miles to the suburban middle of nowhere.) 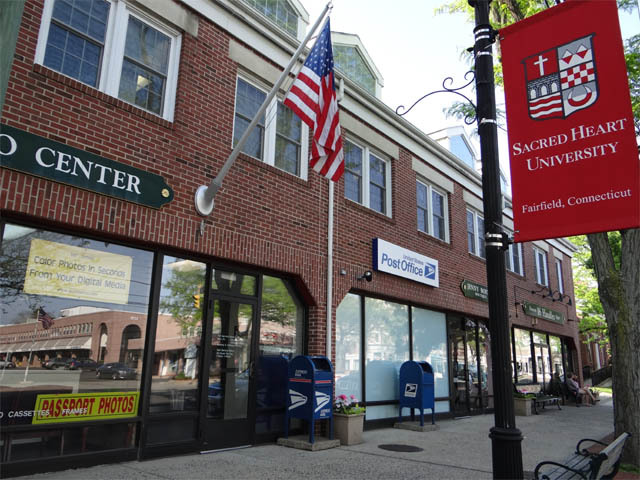 Thus, according to a 2009 article by Westport's Patch, the building is being sold "because the USPS is having financial problems ... and the building is larger than Westport postal workers need now that mail is sorted in Norwalk." At the beginning of 2012 the Postal Service closed its doors on the heart of the Westport commercial district and moved to an ignominious location in an recessed shopping plaza. (It might just be a quarter-mile up the road, but still.) In fact, USPS chose the ugliest, cheapest corner of the ugliest plaza and appended a generic two-square foot white-on-blue sign that states "Westport MPO // Westport, CT". Not only do most people not know what 'MPO' means, but there aren't any other post offices in Westport with which to confuse it! For the privilege of reducing its footprint from 7,650 to 2,500 square feet, the Postal Service is paying $104,400 a year. 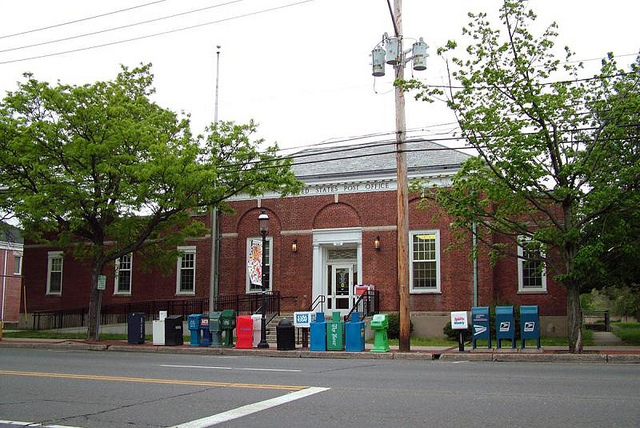 Furthermore, any local businesses who had previously deposited bulk mail at the Westport post office must now travel to the annex in Norwalk to do so. On the plus side, there is now 24-hour lobby access for P.O. Box holders. 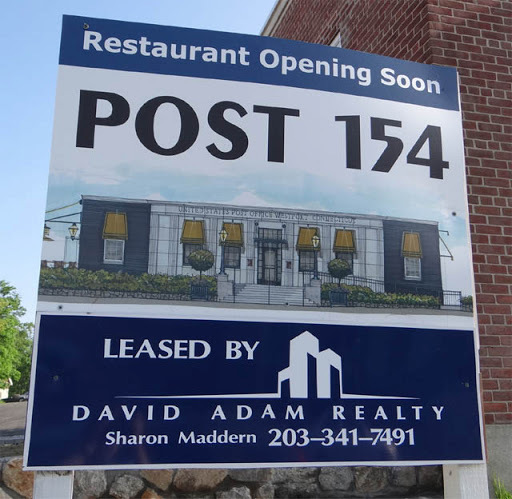 The historic post office building, at 154 Post Road East, whose last day of postal business was Dec. 31, 2011, is presently being converted to a high-end restaurant: Post 154. Hip, isn't it? The location will feature "outdoor dining, a large bar and a room for private parties." As with the high-end luxury furniture store in Greenwich, this highfalutin use is exactly what our grandparents and great-grandparents had in mind when their tax dollars helped to fund these great (formerly-)public works. Fortunately, Post 154 fills a glaring void in downtown Westport as only five other high-end restaurants and cafés have opened there during the past year. Constructed: 1936. Sold: 2012 for $4.3 million. New purpose: Plan B Burger Bar and other tenants. New Deal mural: "Tempora Mutantur et Nos Mutamur in Illis" ("Times Change and We Change With Them") by Alice Flint, 1938. The name of the mural sure is apt, isn't it? The carriers from the 16,000-square-foot Fairfield Main Post Office have been moved to the 1992 Commerce Station post office, a 2.5-mile trek to the industrial corner of Fairfield, which lies by I-95 and the train tracks. (A fun place to pick up one's packages!) This allowed USPS to cut its downtown footprint by moving just a couple hundred feet down the road. USPS's Leased Facilities report should, but does not, reflect this new lease at 1300 Post Road, and as such its footprint and lease terms are not available for publication at this time. The proximity of the new location to the old post office allows for a before-and-after comparison in one photograph! The new post office maintains modern POS [postal computer system] counters and is accessible at all hours. The 44"-by-168" (nearly-four feet-by-sixteen feet) mural now lies in a second-floor conference room at Fairfield's [Sullivan] Independence Hall, the Town Hall. The mural was restored at a cost of $25,000 to the Postal Service, which still owns the art and has loaned it to the town for a 25-year term. Both USPS and the Fairfield Arts Advisory Committee pushed hard to ensure that the mural stayed in its home town. The old Main Post Office is slated to house several tenants, the most prominent of which is a local Connecticut organic burger restaurant known as the Plan B Burger Bar. (Other signature dishes, the Fairfield Citizen notes, include "Lobster Mac & Cheese and Beef Wellington Bites".) There seems to be a theme developing with these post office reuse plans. Only time will tell how many of the 2,000+ historic post office buildings USPS occupies will be sold in the name of supposed progress and [actual or imaginary] debt-cutting. With a name like Plan B Burger Bar, it makes me wonder if birth control pills are on the menu. A Positive Impact of POStPlan?